Log Checks: Why Do Some Logs Have Cracks in Them? Lengthwise cracks in logs are called checks. They alarm some homeowners because they typically appear after the wall logs are stacked in place. Sometimes checking is accompanied by crackling sounds, which raise even more concern. The good news is that checking doesn’t indicate structural failure but is a natural, even common characteristic of wood in log homes. Checking occurs in logs containing the pith, or center of a tree. Checks are prompted by uneven drying and usually appear inside homes during the first heating season, when warm air accelerates wood’s natural drying. Checks on outside walls might start where the sun shines brightest on the logs. Checks range from hairline cracks to deep gashes. 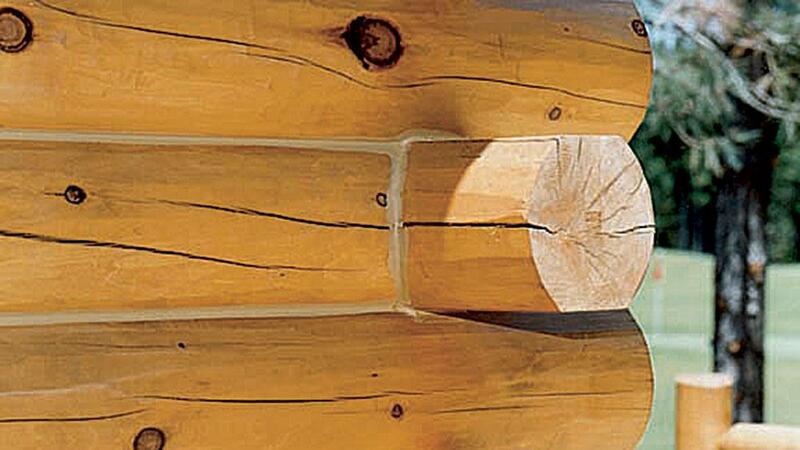 Most checks are an acceptable part of wood’s nature that add character to your logs. Some checks should concern you, however. Exterior checks on the top surface of round wall logs require your attention. Rain or melting snow may collect in these checks, promoting rot. Even if you slather on plenty of water-repelling stain and treat your logs with a wood preservative, protection might not extend into new, deep checks. The recommended response to upward-facing checks on outside wall surfaces is to caulk the crevices to keep moisture out. If you don’t want to caulk all the way up to the visible surface, fill in the check almost to the top and then apply water-repelling stain. If checking isn’t something you think you can live with, avoid heart-centered wood, which contains the pith. But heartwood is the strongest part of the tree. One way to minimize checking is to buy logs from a manufacturer who saws a kerf along one edge of a green log before it dries. The kerf acts as a stress-release slot by luring the check to occur along the kerf and preventing additional checks from occurring randomly elsewhere on the log.